Looking for a Vet for Rare and Exotic Animals? While most people think about owning a traditional pet such as dogs and cats, there are many people who own or provide care for rare and exotic animals. Just because these animals may not be mainstream like the traditional pet doesn’t mean that they don’t deserve the same kind of care. Anyone who is caring for a rare or exotic animal needs to make sure that the vet they take their pet to is able to provide the care that they deserve. What should people look for in a vet if they have a rare or exotic animal as a pet? What is a Rare or Exotic Animal? Many people may be wondering whether or not their pet qualifies as a rare or exotic animal. While most people understand that dogs and cats are far from exotic, there are other animals that qualify as rare or exotic. The surface definition is that any animal that isn’t a common pet (such as a dog or a cat) or domesticated livestock will require the attention of an exotic animal vet. For example, hamsters, guinea pigs, and rabbits are common pets that also qualify as rare and exotic. Most reptiles and amphibians, such as snakes, lizards, frogs, and salamanders also qualify as exotic. Birds are exotic as well. 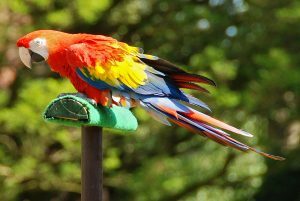 Many people own parrots or macaws that will require a veterinarian with experience in this space. The reason why people need to find a specific vet for their rare or exotic animal is because not all vets are trained to provide the specialized medical care that these animals require. In fact, vets who treat and care for rare or exotic animals need to have additional training to provide care for those animals. This may entail something similar to a residency program in that space of a fellowship program after graduating from vet school. In this program, vets are trained to provide care specifically tailored to meet the problems that these animals develop. It doesn’t take a vet to realize that dogs and cats may have slightly different problems than reptiles or amphibians. What Kind of Medical Problems Does a Rare or Exotic Animal Veterinarian Handle? In brief, an exotic animal veterinarian is trained to handle a variety of issues that arise related to the care of an exotic animal. An exotic animal veterinarian is able to provide preventative care and recommend nutritional options to exotic animals. They are also trained to provide acute care to exotic animals who may fall ill or become injured. Some exotic animal vets are also trained to provide surgical procedures to exotic animals when necessary. For more specific information regarding the care of exotic animals, it is best to check with the specific veterinarian themselves. Part of being a responsible pet owner involves taking the time to make sure that the vet is qualified to provide care to that pet. Rare and exotic animals require a specialized type of veterinary medicine that may not be as mainstream as traditional pet medicine. Contact us today for more information regarding pet care!